At least it’s not Monday anymore, right? And I’m not hurting for protein this week while enjoying so much tempeh. 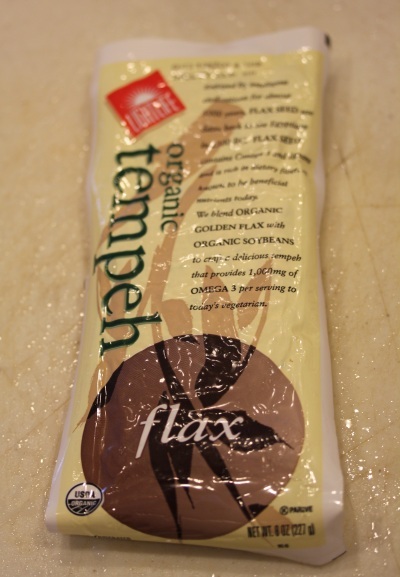 Tonight I grabbed Lightlife’s Organic Flax Tempeh for dinner. Flax seeds are a super food that I don’t enjoy as much as I probably should except when I remember to dump some in smoothies or have time for a dehydrator recipe that includes them. So it’s nice having flax seeds added to already nutrient-dense tempeh in a form I can cook in minutes. Wow, 20 grams of protein per serving and plenty of fiber! 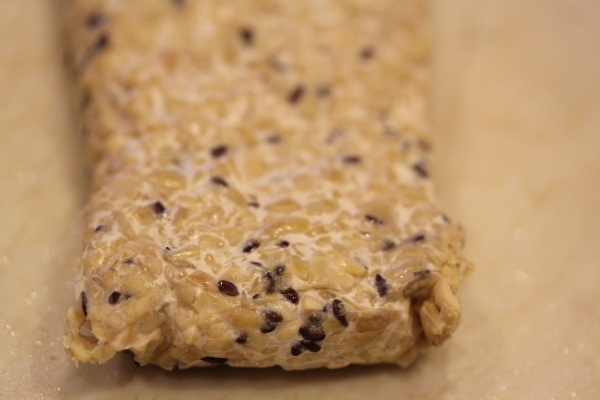 And the flax seeds add a nice texture and flavor change compared to plain tempeh. After a long day at work and running errands after, I didn’t feel like spending a lot of time on dinner. 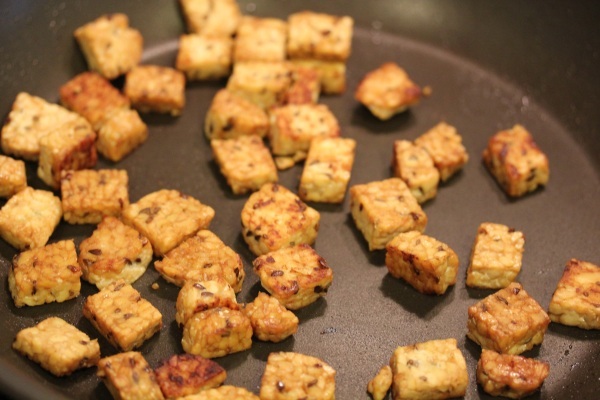 I just cubed the tempeh, sauteed it stove top in a little sesame oil over high heat. 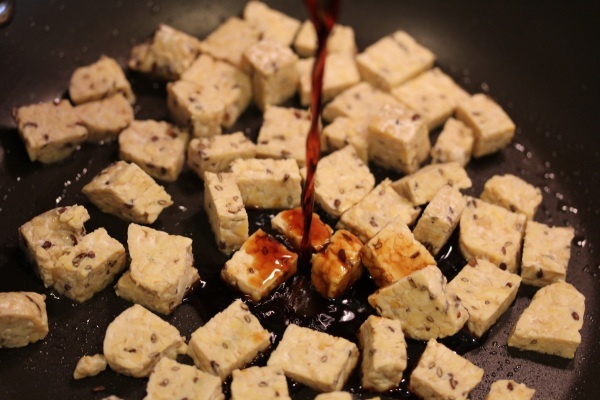 Then I added a couple of tablespoons of soy sauce to sear the cubes in. Yum, the result was crispy, savory cubes after 5 minutes. 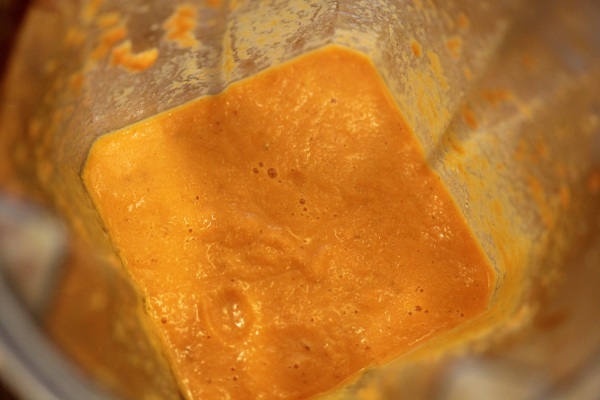 To go with it, I whipped up Gena’s Carrot Miso Dressing to coat a salad and the tempeh cubes. 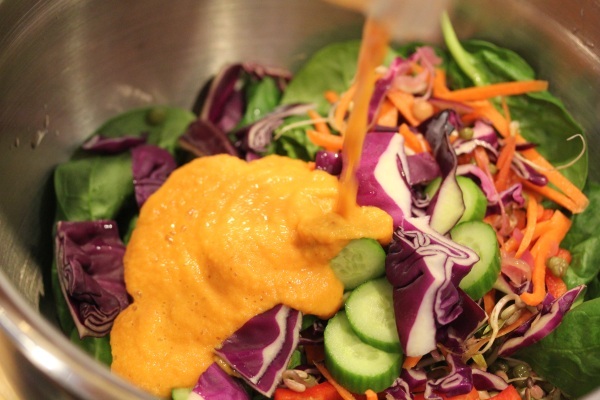 It’s on of my favorite dressings – sweet, savory, tangy, and perfect for coating a salad without weighing it down or making it too rich. 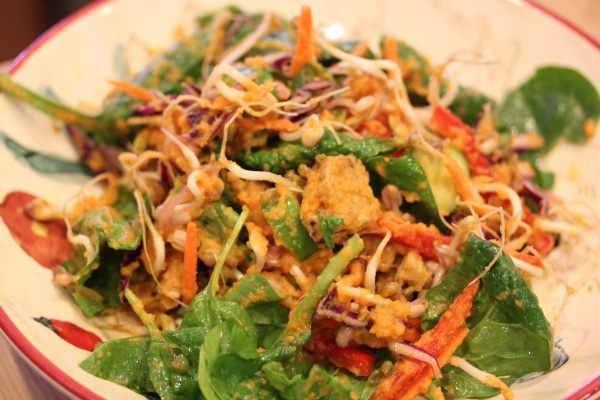 Great in this case since the tempeh cubes were adding plenty of protein and heartiness to the salad. You’ve gotta try her dressing if you haven’t yet! But the tempeh cubes made a delicious and fast protein add to my raw salad turning it into a filling dinner. 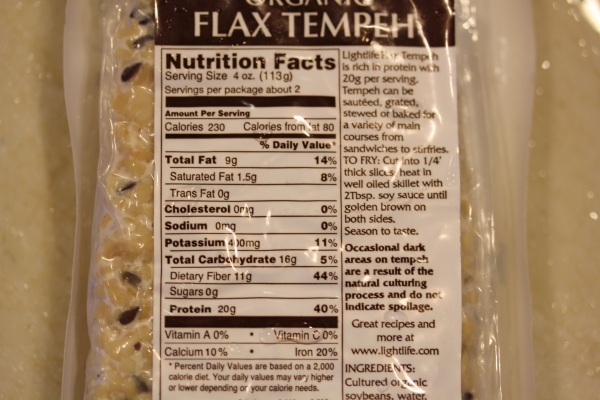 Lightlife’s Organic Flax Tempeh has a lighter, almost fluffier texture compared to plain tempeh with the flax seeds added and it seemed to absorb the soy sauce flavors more during the searing. that dressing looks so good. you should try my green monster dressing too (in my recipes) it is vegan and delicious!